The various options for calculating commissions are found by going to Sales >> 6 - Calculate Commissions. Several calculating options are available. The commissions calculator gives you the ability to quickly calculate commissions for a pool of sales. Although you have the ability to calculate for one specific if you so choose. Options for the pool include "all sales for a range of dates" as well as "all sales for one specific salesman." Option 1: Selecting the radio button for "Date Range" will bring up options to select the appropriate dates. Select the dates and sale type that you would like to calculate commissions for here. Option 2: Selecting the radio button for "one specific sale" will give you the option to select the sale you'd like to calculate commission for. Option 3: Choosing the third radio button for "one specific salesman" will give you the ability to pool sales not only by salesman, but also by date and type of sale. Clicking on "Select Salesman" will bring up your Salesman File. 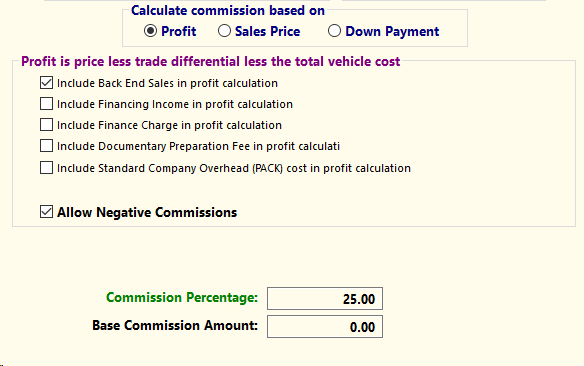 Once the calculation option is selected, you will have several options for how you want your commission calculated. First, select what portion of the deal the commission will be based on. Most dealers base commission on the profit, though you do have the option to use the "Sales Price" or the "Down Payment". 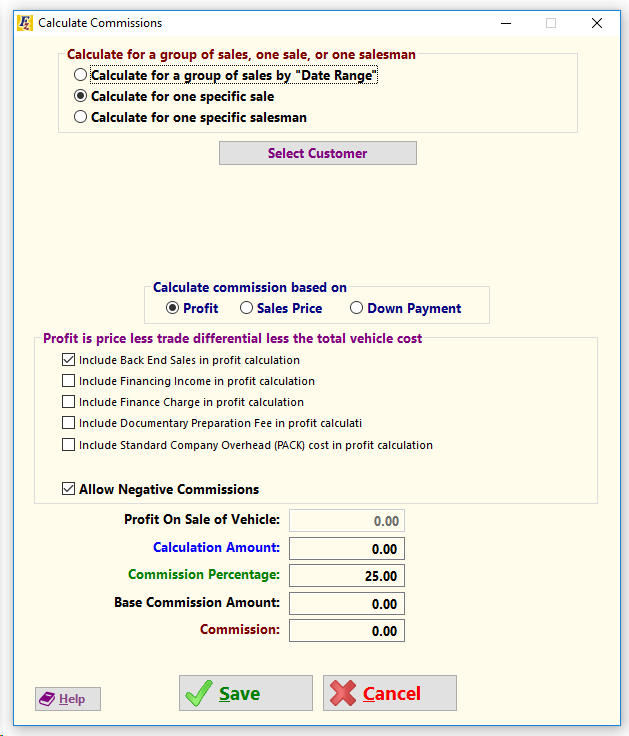 Once you've selected how you want to calculate the commission, choose from the check-boxes what items you would like to include in the calculation. If the sales person will be receiving a base commission, you may enter that into the box. Finally, set your commission percentage and then click "Save". Note: If you previously applied a calculated commission to a deal, this tool in bulk will overwrite anything already calculated. The one exception to this rule is in cases where a commission is split between two sales people. Once the system is finished calculating commissions, a report will pop up.